Salomon's Enduro XT800 is another one of those carving-oriented All-Mountain skis that finds itself reclassified by today's standards as strictly a frontside carver. Yes, the ski employs some tricks to improve flotation and soft snow performance, but a 79mm waist may as well be a needle these days when it comes riding anything off-piste. So let's just call the Enduro XT 800 what it is—a high-level hard snow carver. Viewed through that lens, the XT 800 is quite a solid performer. The Enduro doesn't have the racing edge that the skis in the Head line feature, and neither does it have the exceptional friendliness of Rossignol's Pursuit line, and so initially I found myself somewhat ambivalent about its ride. I place a great deal of emphasis on feel—that admittedly subjective experience of turning a ski loose on the snow and seeing what fires in your brain. If anything, the Enduro struck me as almost transparent underfoot. In terms of 'feel', the ski didn't create a strong impression, positive or negative. However—and do note this comment—I really liked the way I was skiing on it. 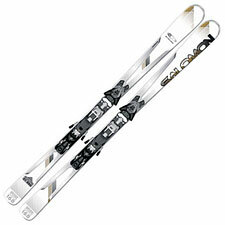 My turns immediately sharpened on the Enduro XT; at speed, I wasn't struggling with the ski or the slope in any way. Indeed, the XT 800 just quietly excelled. I'm going to hedge a bit here and note that I was riding a shorter 168cm ski (with a 14.6 meter turn radius), whereas many of the other skis I demoed were pushing toward 180cm, so it makes sense purely in terms of sizing that the Enduro would be a better fit for me. Still, my first impression remains: the XT 800 may not offer the most exciting feel, but it is certainly a very strong pick for a GS-oriented technician. That proved true on late-in-the-day, rutted-out, steep, hard snow at very high speeds. I never once got the impression that I was overpowering the Enduro XT 800, which can be a problem with skis in this class. The ski sits nicely in the sort of nether-land between the true race variants and the softer, detuned carvers that are hit-or-miss depending on your expectations. Overall, I'm going to rate the Enduro XT 800 as one of the better modern carvers. Good skis in this category are hard to find, so take note. The Enduro is certainly worth a try if you're looking for a high-level hard-snow ski that rewards but also doesn't demand elite-level skill. Transparency, it turns out, can be compelling after all.